So I am sure you have all heard of/ had the POM iced teas… you can buy them in the grocery store, they come in a glass jar looking thing which you can keep…. I only found out about them a year ago when I started wondering where all the POM glasses in our cabinet were coming from… of course, my brother was thinking he would start his own line of glassware for our kitchen. BAHAH . Anyways, they recently came out with an Iced Coffee drink which, to be honest, when the POM man was handing them out like candy in the spring at USC, the last thing i felt like drinking as I was sweating balls was a hot little grenade of POM coffee. Yuck! BUT, the guy gave me a few…(more like a box) and I took them home reluctantly… My mom one day found them between all the stuff I had moved home and started guzzling them like it was her new found Starbucks… I finally decided to try one (they have chocolate and vanilla) I decided to mix the two… and WOA- amazing. I’m a diehard Coffee Bean and Tea Leaf person, so roaming to anything that is not made by a barista is typically out of my comfort zone, but I have never been so impressed with a quick coffee drink. I mean you throw them in the fridge then when your running out the door you throw one in your purse and your not only… A. Saving $4 but B. your not going to be running late. So easy and SO good. Definitely recommend you pick one up next time your at the store! PS- I recommend drinking them cold… i mean who drinks warm iced coffee? NOT I! 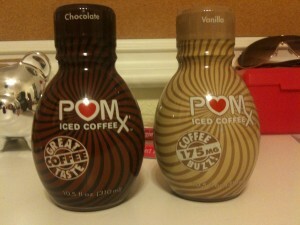 MMM POM P<3M Iced Coffee Drinks!